Internet : If you are in the information technology (IT) field, then there must be million things on your mind. This design will save you all the time you need and still give you the IT professional look that you desire to reflect your technical business and ideas. Template 57211 relates directly to the IT industry. This is your choice if your company or community is an internet service provider (ISP), website host, web designer, search engine optimization, email services or related. Bonus with every purchase With each template purchase you get Free Web Design Elements: photos, fonts, icons, 3d models, sounds. 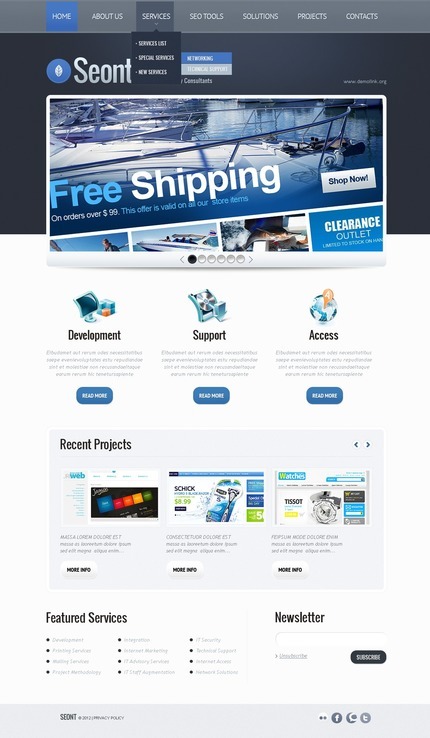 Buy template 57211 from zeronese today and get access to the Free Clipart & Free Web Design Elements library.